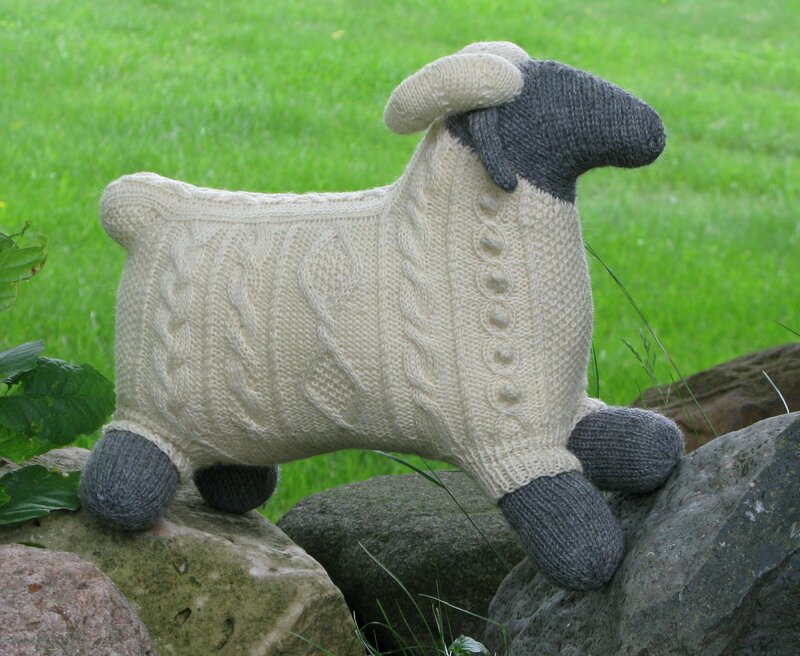 Create your own Sam the Ram with this downloadable pattern, exclusively from 3 Kittens Needle Arts! Optional: a few yards (or meters) of black for embroidering eyes. Gauge The stockinette stitch pattern needs to be a little denser than usual. Gauge is not too critical, as long as it is 6 or more stitches per inch. Optional: 1 set of Size 3 (3.25 mm) double point needles (or 1 size smaller than those needed to meet the stockinette stitch gauge). From the Designer’s pattern introduction Sam was inspired by a drawing on a note card of a sheep wearing an Aran-patterned sweater. As soon as I saw the drawing, I knew I had to try to duplicate that look in knitting. In my version, the Aran-patterning is clearly the fleece, and not a separate sweater.